Powers/Abilities: Monstrous in size and form, was powerful enough to conquer worlds and to slay millions. Drachiss had superhuman strength (Class 25-75?) and durability, able to withstand blows from Achilles and Ajax without serious harm. He can absorb various forms of energy and use it to fire destructive energy blasts from his hands. In addition, the tentacles extruding from either side of his waist could probe the minds of others, a process which usually rendered the subject unconscious. He can teleport, though there are certain limitations to this ability; he could only escape his extradimensional prison after Delphi formed a portal to view him in her scrying pool, and he could be forced to teleport through her portals without his consciously trying to do so. It is unclear whether he can survive in outer space. Drachiss was experienced with the futuristic technology of 500 years in the future, and could create time machines. 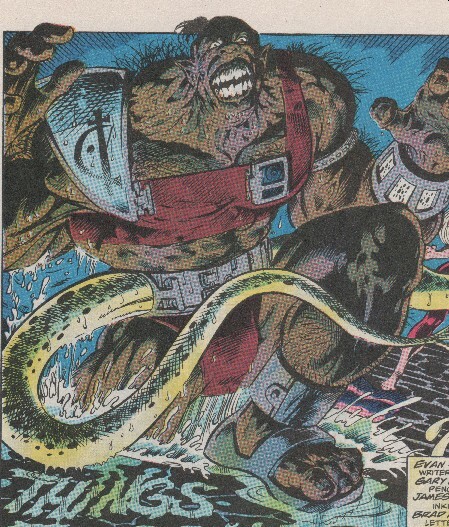 (Incredible Hulk II Annual#18/3 (fb) - BTS) <Late 25th to early 26th century of Earth-9218> - Drachiss allegedly slaughtered millions of innocents and wreaked untold havoc as a despotic tyrant. He had some experience with the Agamemnon of his reality, which led him to not trust Agamemon. At some point he was trapped in an extradimensional prison. (Incredible Hulk II Annual#18/3 (fb) - BTS) - Agamemnon received a vision from his future self, warning of Drachiss. (Incredible Hulk II Annual#18/3) - Agamemnon instructed Delphi to observe Drachiss via her scrying pool, but Drachiss used this connection to escape his extradimensional prison into the Mount. Drachiss probed Delphi's mind, learning he had been drawn into the past and leaving her unconscious. Achilles arrived and attacked Drachiss who overpowered him and threw him through the ceiling, which drew the rest of the Pantheon -- Ajax, Atalanta, Hector, and Ulysses. Drachiss was pained by Atalanta's energy arrows, but then used own energy to blast her. Agamemnon projected his hologram to try to convince Drachiss to end the battle, but Drachiss knew better than to trust him and prepared to depart. He announced his plan to build a time machine to return to and conquer the future or, failing that, to conquer this era. Ajax tackled Drachiss, but the time-traveler stunned him with a mental probe and then used his body to batter the rest of the Pantheon. Agamemnon telepathically showed Atalanta that only Delphi could defeat Drachiss, so she awakened Delphi and had her create a portal into outer space. Achilles rushed Drachiss, allowing him to try to probe his mind, which proved invulnerable to his probing. Feigning incapacitation, Achilles then surprised Drachiss and knocked him into the portal. Drachiss screamed as he faded into deep space. Agamemnon then revealed that he knew Drachiss would escape through Delphi's portal, but that he had allowed it to happen because Drachiss was otherwise fated to escape and cause the deaths of millions of innocents in the future. Comments: Created by Evan Skolnick, Gary Barker, and James Palmiotti.